Residents in Clifton have knocked back Calderdale Council plans to introduce a 20mph zone in the village. The zones were expected to implemented by the Council in other parts of the area later in the year. Calderdale Council is introducing blanket 20mph zone across Halifax town centre and elsehwre in Calderdale as part of a Love Our Streets campaign. Paul Butcher with the new signs. However, after the consultation and feedback from the community, the plans have been shelved for the time being. Paul Butcher, Calderdale Council’s Director of Public Health, said: “We continue to roll out the 20mph speed limit in residential streets across Calderdale to help make our streets safe and pleasant wherever we live and however we travel. “As part of the rollout we have considered all feedback on the proposal to introduce 20mph in Brighouse, Rastrick, Hove Edge, Bailiff Bridge, Lightcliffe, Woodhouse and Clifton. “It has been agreed that the speed limit will go ahead in all of these areas, except Clifton, and we expect this to happen by May 2017. 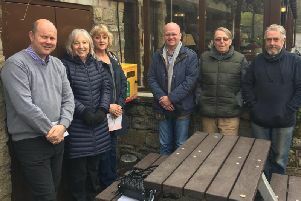 Brighouse Councillor Scott Benton said the results of the Council’s consultation were fairly even across Brighouse and Rastrick in terms of those for and against the zones but the one exception to this was in Clifton where a clear majority of residents were against the zones. “I am pleased to see that the Council have taken on board the views of residents and that Clifton will be exempt from a 20mph speed limit as a result. “We will discuss the situation with regards to Clifton in six months’ time once again with the council but the view of the community and councillors is generally that Clifton should not be included and our view is unlikely to change’.